The Department is pleased to welcome Adalberto Ottati, doctoral student at the University of Rome, La Sapienza & Junior Researcher at the Institut Català d’Arqueologia Clàssica, Tarragona (ICAC). Adalberto will be visiting our Department for the whole spring term as part of the Erasmus exchange programme we established with ICAC last year. During his stay, Adalberto will continue his research on the historical, architectonical, and artistic aspects of a section of Hadrian’s Villa that is not known very well: the so-called “Accademia”. This complex is made by different buildings which stand out for their uniqueness, both in terms of style and structure: the alternating of straight and curved lines; the mixing of original architecture and classical style; and the use of artificial and natural compositions to create idyllic landscapes as background to the architecture. Scholars have traditionally identified the Accademia complex as the emperor’s summer residence, but the most recent studies tend to interpret it instead as a palatial area reserved to the empress Vibia Sabina. 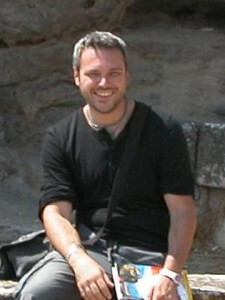 Adalberto’s PhD thesis focuses on largely new archaeological evidence comprising both statuary and architectonic finds, emerged in recent and ongoing archaeological investigations at Hadrian’s Villa, which he has co-directed since 2003. Niki Karapanagioti, who is now in her third year as a doctoral researcher in the department, has been awarded a scholarship from the Panagiotis Triantafyllidis Bequest Fund, which is for graduate students from the Peloponnese and is jointly administered by the Greek ministries of Economics and Education. Niki’s research on Herodotus is already funded by a prestigious award from the Greek State Scholarship Foundation (Ίδρυμα Κρατικών Υποτροφιών or ΊΚΥ); this new award has been back-dated to the first year of her PhD, before her current funding started. Congratulations Niki!